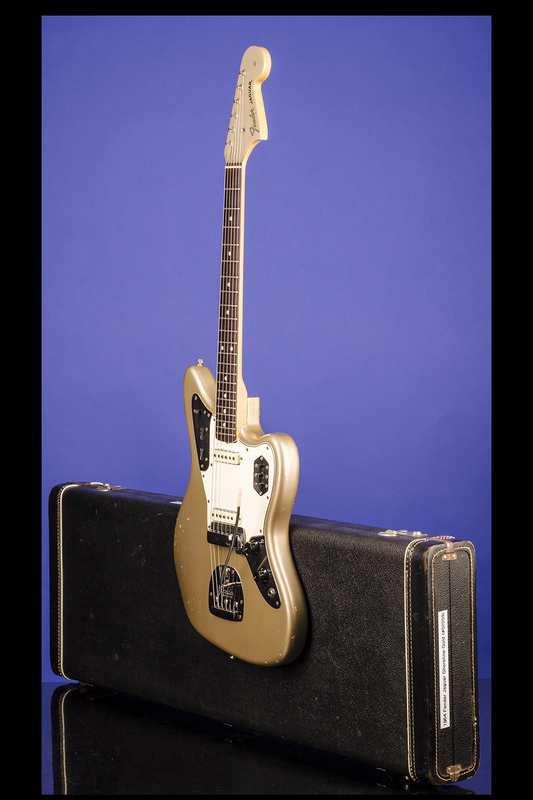 This super rare 'Shoreline Gold Metallic' custom color, 13 3/4-inch-wide Jaguar weighs 8.40 lbs., and has a contoured solid alder body. 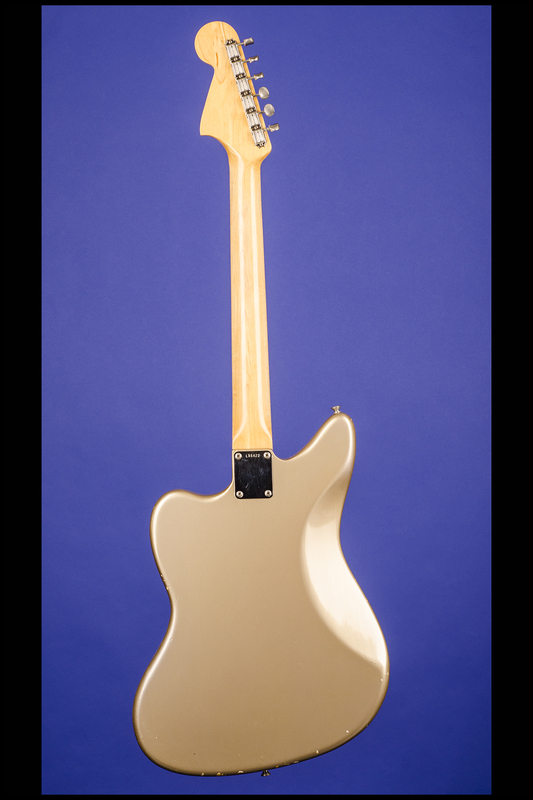 One-piece maple neck with a comfortable "B" nut width of just over 1 5/8 inches, a scale length of 24 inches, and a wonderful medium-to-thick profile. Curved veneer rosewood fretboard with 22 original medium frets and inlaid pearloid dot position markers. 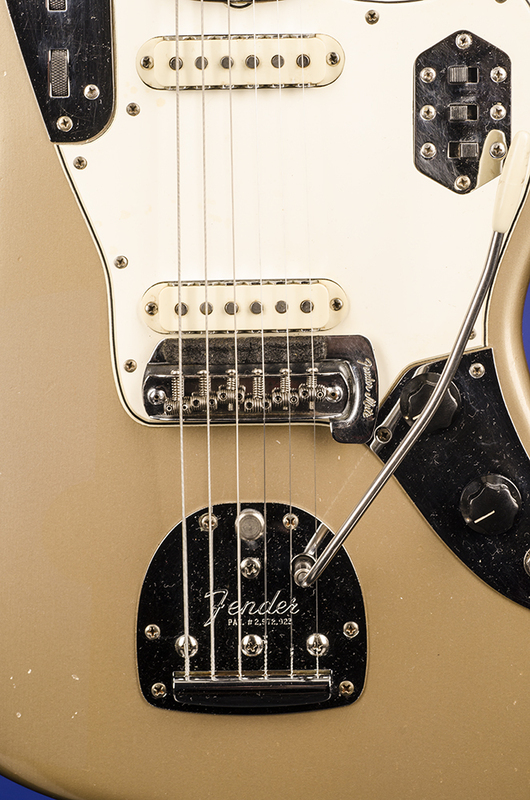 Matching 'Shoreline Gold' headstock face with Fender 'transition' logo in gold with black trim and "Des. 186,826 Pat. 2,960,900 2,972,923 3,143,028 & Pat. Pend.". "Offset Contour Body" decal in black at the ball end of the headstock. Single "butterfly" string tree with large metal spacer. The neck is stamped "1 DEC 64B." (the "B" is hard to see in natural light). Four-bolt neck plate with serial number "L55422" between the top two screws. Individual single-line Kluson Deluxe tuners with oval metal buttons and "D-169400 / Patent No." stamped on the underside. Two white oblong Strat-like pickups with notched metal side plates with outputs of 7.06k and 5.97k. Three-layer white over black plastic pickguard with beveled edge, ten screws, and aluminum ground shield on the underside. Two controls (one volume, one tone) and jack socket on lower metal plate adjoining pickguard on the treble side, circuit selector (rhythm/lead) slide switch and two roller controls (one volume, one tone) on upper metal plate adjoining pickguard on the bass side, and three slide switches (two for pickup selection and one 'strangle' low-end filter) on metal plate inset into the pickguard on the treble side. The potentiometers are stamped "304 6450" (Stackpole, December 1964). Black plastic Jaguar knobs with white markings. 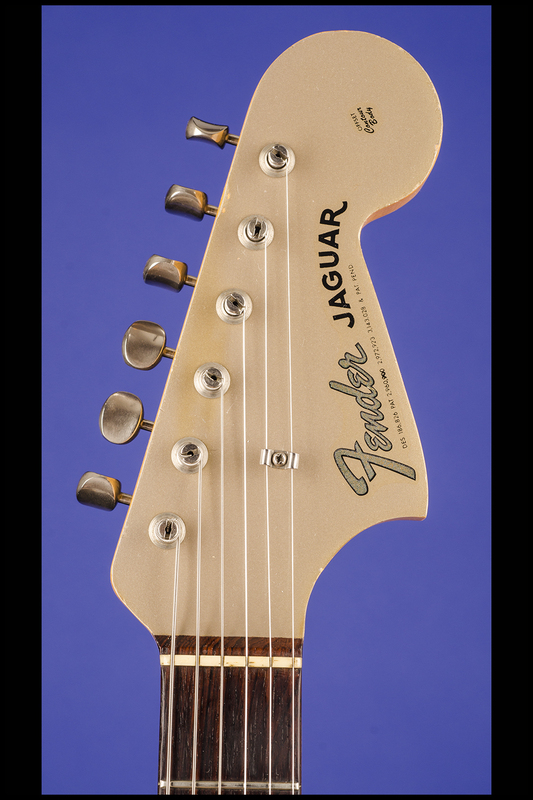 Jaguar/Jazzmaster-type floating tremolo and bridge with six individual fully adjustable threaded saddles and adjustable mute. There is some very light finish checking, and some marks and indentations on the body and a few small areas of finish loss on the body sides. 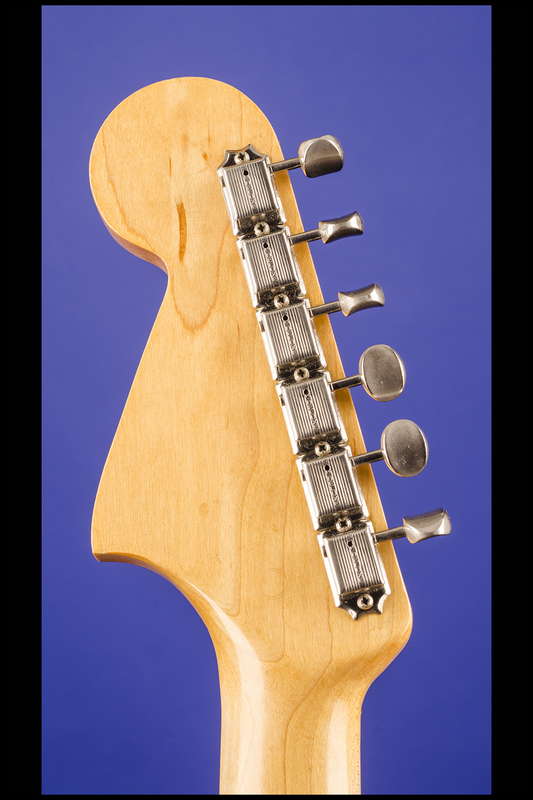 There is the bare minimum of finish loss (playing wear) on the edges of the neck behind the first three frets. The original frets show some very slight playing wear (first four frets only) and a couple of miniscule divots on the fretboard by the first and second frets. Under ultra-violet light only one can see the shadow of a semi-circular decal which was at one time on the bass side of the top of the body - we emphasize again that this cannot be seen with the naked eye! 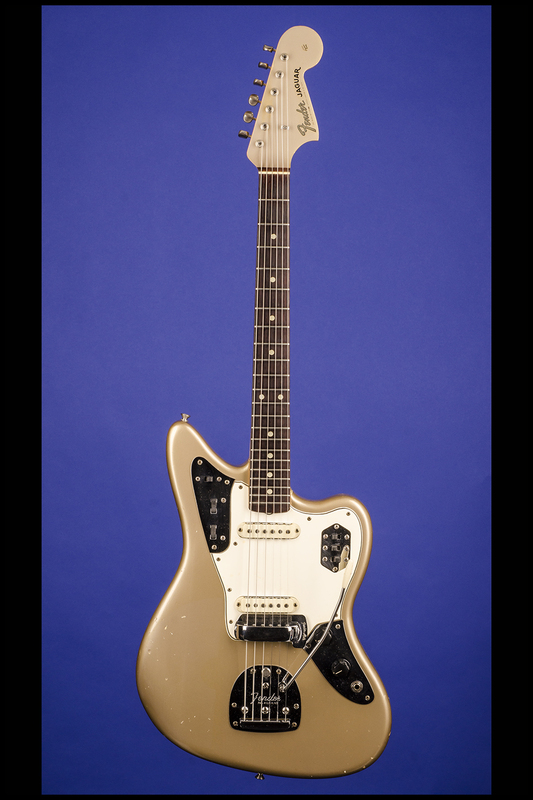 This is only the second Shoreline Gold Metallic Jaguar that we have ever seen and is 100% factory original** and in exceptionally fine (9.00) condition. 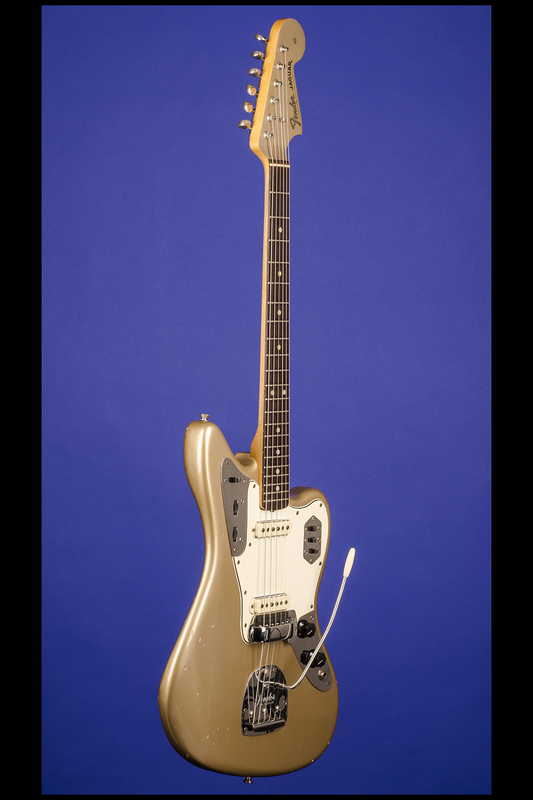 Complete with the original tremolo arm and bridge cover. Housed in the original Fender three-latch rectangular black hardshell case with orange plush lining and black leather ends (9.25). 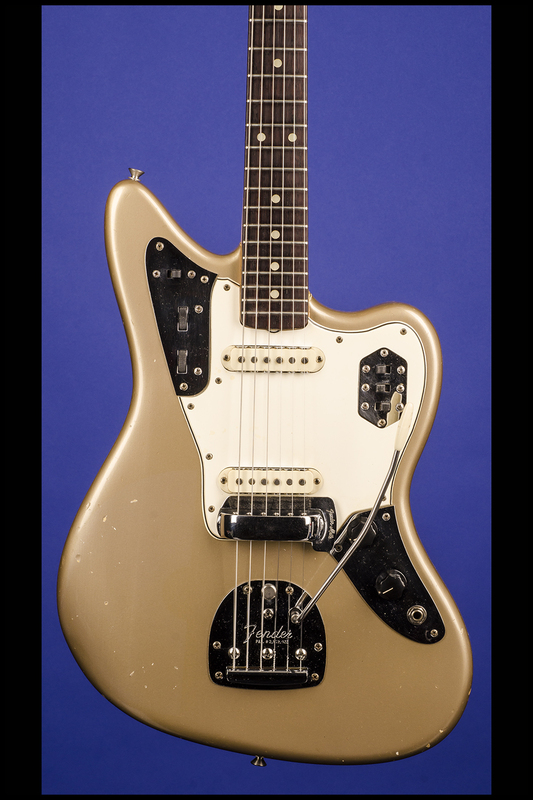 **We have just been made aware that this guitar was sold in 2017 by a USA dealer to a vintage dealer in the UK. The following sentence is from the USA dealer's original description "We replaced one mini slide toggle switch, the mute switch, which had either quit working or been disabled at some point. It's back to original now with a Fender replacement switch". We then spoke to the UK dealer who informed us that the original mini-toggle switch was in the case with the guitar and upon inspection they found it to be perfectly functional - so they replaced the 'replacement' switch with the original 1964 which is why we did not notice this when we took the guitar apart for our detailed examination. 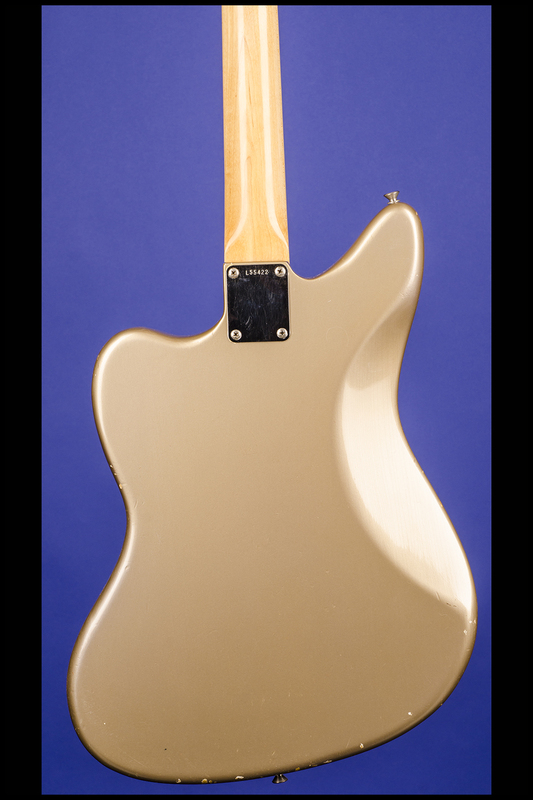 The UK dealer then sold the guitar to one of our clients who then sold it to us. 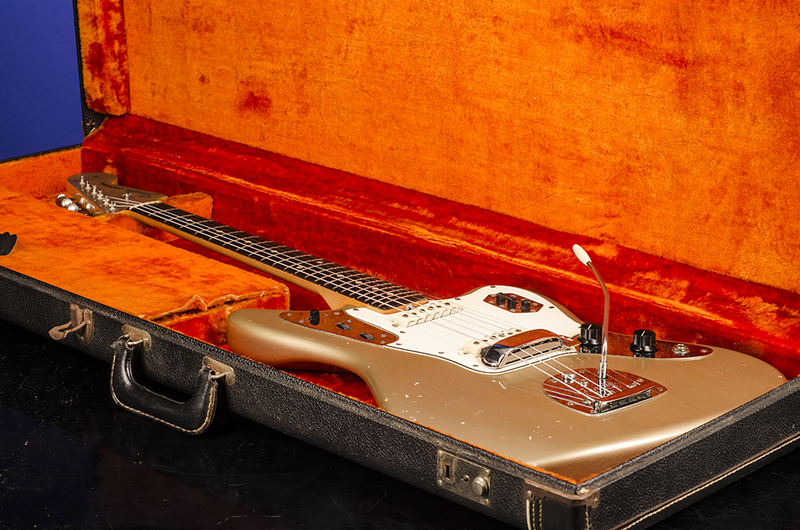 We have detailed 'internal' photographs to verify this statement and in our humble opinion this does not really detract in any way from the originality of this very rare custom color pre CBS Jaguar. Of the more than two thousand guitars that we have fully documented we have never had a Shoreline Gold Metallic Jaguar. 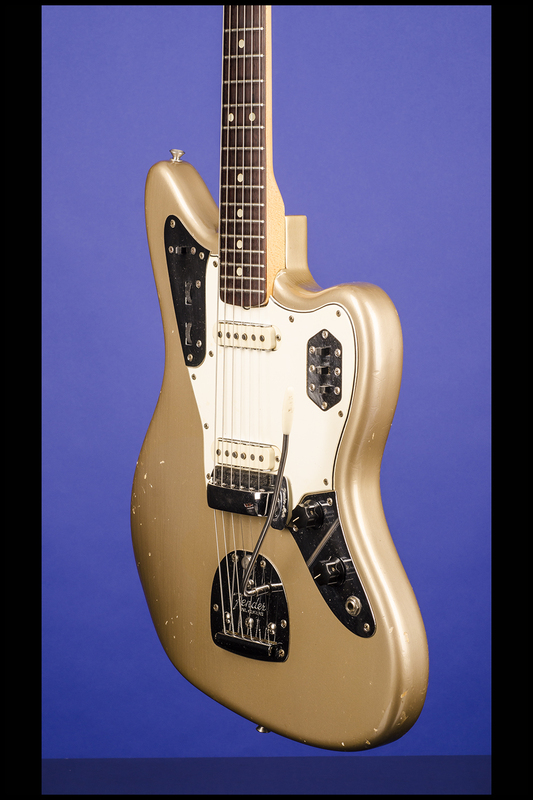 We have sold three Shoreline Gold Guitars over the past fifteen years - a 1963 Stratocaster, a 1963 Jazzmaster and a 1966 Jazz Bass BUT never a Shoreline Gold Jaguar. 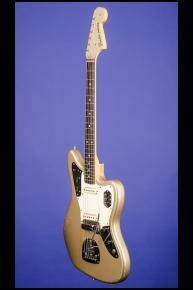 The only other one that we have seen was a 1962 example which appears in Norman's Rare Guitars: 30 Years of Collecting. (page 90). Shoreline Gold Metallic was used on Pontiac cars from 1959 to 1960. 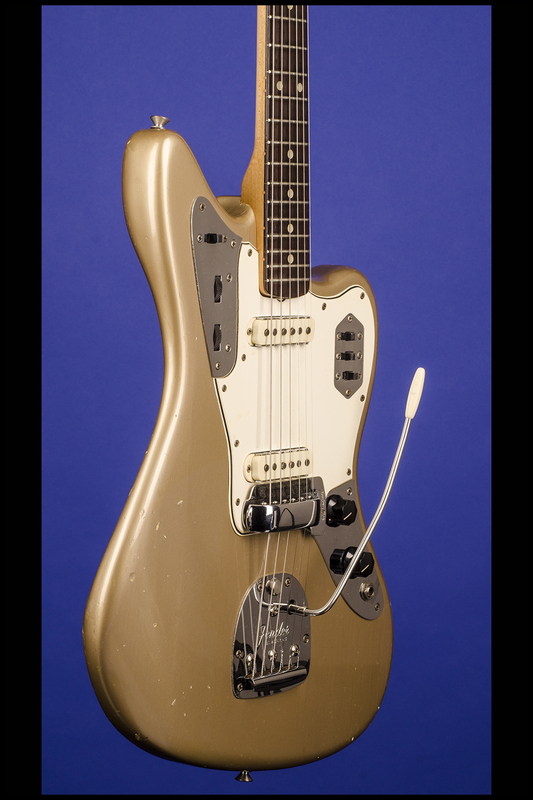 This super rare color was used on Fender guitars between 1960 and 1965.